1.Preheat oven to 450°. Spray large rimmed baking pan with cooking spray. In medium bowl, stir walnuts, zest, syrup and dill. 2.In large bowl, toss asparagus, potatoes, 1 tablespoon oil, and 1/4 teaspoon each salt and pepper; spread in single layer on prepared pan. Roast 15 minutes. 3.Coat fish with remaining 1 tablespoon oil; sprinkle with remaining 1/4 teaspoon each salt and pepper. Spread top of fish with mustard; press walnut mixture over mustard. Push vegetables to 1 side of pan; place fish on opposite side of pan. 4.Roast 10 minutes or until internal temperature of fish reaches 145° and vegetables are crisp-tender. 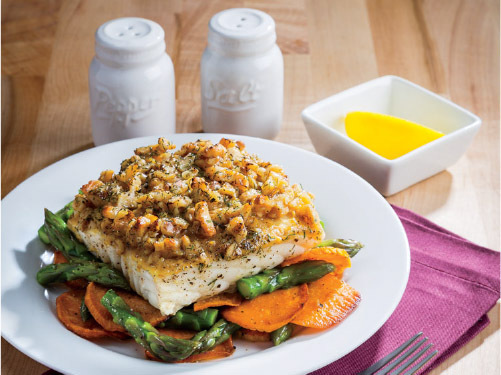 Heart healthy omega-3 fats are plentiful from the fish and walnuts. DHA and EPA forms of omega-3 found in fish have the strongest health benefits.